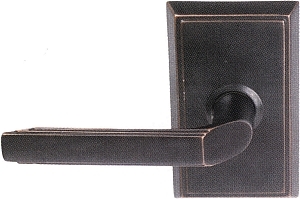 The Emtek Milano door lever is a very versatile lever. It has many different rosettes and functions available for it. It has a total of 8 finishes and you can have this lever in either left or right handing. The Milano lever can be customized to go on any door in your house. If you are looking for an easy solution to your door hardware replacement project check the Emtek Milano lever. It will be sure to satisfy.